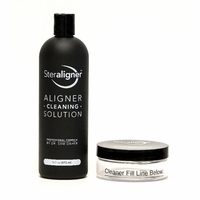 Help Me Choose the Right Retainer Cleaner! Home » For Retainers » Help Me Choose the Right Retainer Cleaner! How often do you wear your retainer? What type of retainer do you wear? Does your Hawley retainer contain metal solder? Metal solder is a silver glob which attaches an extra piece to your retainer. Does your retainer have a lot of white plaque buildup that is difficult to remove? 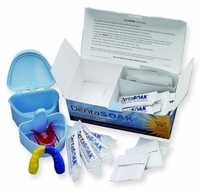 Are you concerned about Persulfate in your retainer cleaner? Persulfate is a chemical that causes an allergic reaction in some people. DentaSoak, Steraligner, and Dentibrite are best to remove heavy plaque buildup after a few consecutive cleanings. DentaSoak, Steraligner, and Dentibrite are best for removing heavy plaque buildup after a few consecutive cleanings. 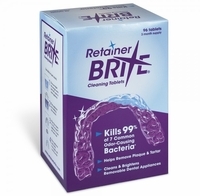 Cleanse Freshen Go, OAP, and Retainer Brite are best for maintaining retainers that don't have heavy plaque buildup. DentaSoak, Steraligner, and Dentibrite are best for removing heavy plaque buildup after a few consecutive cleanings. Cleanse Freshen Go and OAP cleaners are best for maintaining retainers that don't have heavy plaque buildup. 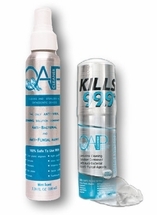 Warning: To prevent the solder from disintegrating, use DentaSoak or Dentibrite only an initial 3 or 4 times to remove the plaque, then switch to Cleanse Freshen Go Spray or one of the OAP Cleaners for daily maintenance. Warning: To prevent the solder from disintegrating, use DentaSoak, Dentibrite, or SonicBrite only an initial 3 or 4 times to remove the plaque, then switch to Cleanse Freshen Go Spray or the OAP cleaners for daily maintenance. Warning: To prevent the solder from disintegrating, use DentaSoak or SonicBrite only an initial 3 or 4 times to remove the plaque, then switch to Cleanse Freshen Go Spray or one of the OAP cleaners for daily maintenance. 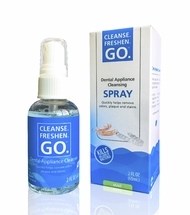 You can use DentaSoak, Steraligner, or Dentibrite a few consecutive times to remove heavy plaque buildup, then use Cleanse Freshen Go Spray or one of the OAP Cleaners for daily maintenance if desired. 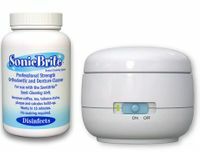 SonicBrite, DentaSoak, Steraligner, and Dentibrite should remove heavy plaque buildup after a few consecutive cleanings. After that, you can switch to any other retainer cleaner to keep the plaque from building up. Warning: To prevent the solder from disintegrating, use DentaSoak, Steraligner, or Dentibrite only an initial 3 or 4 times to remove the plaque, then switch to Cleanse Freshen Go Spray or one of the OAP cleaners for daily maintenance.